Jim Johnson is a Democratic candidate for New Jersey Governor, a former federal prosecutor, and a former “Under Secretary of the Treasury for Enforcement” in the Clinton administration. In a telephone press conference on Thursday, March 30th, Johnson announced that he filed a complaint with the New Jersey Election Law Enforcement Commission (ELEC) against front-runner Phil Murphy. Johnson asserts that Murphy used his non-profit companies as “dark money” organizations to “test the waters,” far in advance of announcing his run for governor. According to Johnson, this means that Murphy was legally a candidate at that time and was therefore required to comply with campaign finance laws. Phil Murphy set up and used these non-profits to prepare his run for governor and for his personal political benefit, which allowed Murphy to avoid registering, disclosing or being held accountable by ELEC or the public during the initial phase of his campaign…. It also allowed him to avoid the public and media scrutiny that would have come with declaring a campaign for governor in 2014…. [By] implementing this political scheme, Phil Murphy was able to avoid public disclosure to ELEC of over $5.1M in donations and expenditures in support of his campaign for governor. and 98% of the funds spent went to people or vendors eventually employed by the Murphy Campaign. 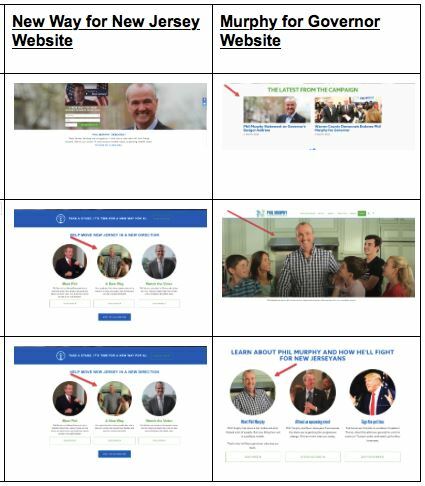 and once they closed, many of the pictures, phrases, video, and other digital “assets” were then used (are currently used) on Murphy’s campaign website and official campaign materials. Finally, as of this writing, newway4nj.com redirects to Murphy’s official campaign page. In 2012, ELEC ruled that then-Senator Barbara Buono violated these same statues with only $37,000 exchanging hands—in exactly one transaction. Buono used her Senate campaign account to pay for an eighty-question poll which included two questions asking people their opinions on the upcoming governor race and whether they would consider voting for Buono, if she happened to be a candidate. This is vastly less than the $5 million Murphy is accused of spending, which includes more than $700,000 in unaccounted expenditures—across many transactions and occurring over more than a year. UPDATE: Complaint document now available and linked. Republished on Ocean County Politics.